Symphony No. 5 by Gustav Mahler was composed in 1901 and 1902, mostly during the summer months at Mahler's holiday cottage at Maiernigg. Among its most distinctive features are the trumpet solo that opens the work with a rhythmic motive similar to the opening of Ludwig van Beethoven's Symphony No. 5, the horn solos in the third movement and the frequently performed Adagietto. The musical canvas and emotional scope of the work, which lasts over an hour, are huge. The symphony is sometimes described as being in the key of C♯ minor since the first movement is in this key (the finale, however, is in D major). Mahler objected to the label: "From the order of the movements (where the usual first movement now comes second) it is difficult to speak of a key for the 'whole Symphony', and to avoid misunderstandings the key should best be omitted." The score appeared first in print in 1904 at Peters, Leipzig. A second "New Edition", incorporating revisions that Mahler made in 1904, appeared in 1905. 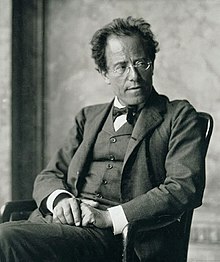 Final revisions made by Mahler in 1911 (by which time he had completed his 9th Symphony) did not appear until 1964 (ed. Ratz), when the score was republished in the Complete Edition of Mahler's works. In 2001, Edition Peters published a further revised edition (ed. Reinhold Kubik [de]) as part of the New Complete Critical Edition. This edition is the most accurate edition available so far. [according to whom?] Previous editions have now gone out of print. is followed by a somber, funeral march (the primary theme). The march is twice interrupted by a calmer secondary theme. and leads into the first theme. Rehearsal mark 5, marked im Tempo des ersten Satzes "Trauermarsch", introduces a theme accompanied by the sighing motive and a repeated quaver motive from the beginning of the movement. Later, another return to the Tempo des ersten Satzes: Trauermarsch, brings a return to the Secondary Theme of the first movement. A triumphant choral breaks forth but dissolves into a return of the tragic material of the opening of the movement. The central scherzo develops several waltz and ländler themes. The final rondo is a contrapuntal tour de force. Several of the themes evolve out of the fragments heard in the opening measures. The last movement also utilizes themes from the Adagietto as well as the chorale from the second movement. The symphony is generally regarded as Mahler's most conventional symphony that he had yet written, but from such an unconventional composer it still had many peculiarities. It almost has a four movement structure, as the first two can easily be viewed as essentially a whole. The symphony also ends with a rondo, in the classical style. Some peculiarities are the funeral march that opens the piece and the Adagietto for harp and strings that contrasts with the complex orchestration of the other movements. A performance of the symphony lasts around 70 minutes. Performed by the Virtual Philharmonic Orchestra (Reinhold Behringer) with digital samples (Garritan Personal Orchestra 4). Tempo is slightly faster than usual, at duration 8:44. The fourth movement may be Mahler's most famous composition and is the most frequently performed of his works. The British premiere of Symphony No. 5 came 36 years after that of the Adagietto, conducted by Henry Wood at a Proms concert in 1909.
und meine Liebe, meine Wonne! I cannot tell you with words. can I with anguish declare. It lasts for approximately 10 minutes, and Mahler's instruction is Sehr langsam (very slowly). Mahler and Mengelberg played it in about 7 minutes. Some conductors have taken tempos that extend it to nearly 12 minutes (viz. recordings by Eliahu Inbal, Herbert von Karajan, and Claudio Abbado), while Simon Rattle with the Berlin Philharmonic performed it in ​9 1⁄2 minutes. The shortest recorded performance is from Mengelberg (Concertgebouw, 1926) at 7′04″. The longest commercial recording is Bernard Haitink (Berliner Philharmoniker, 1988) at 13′55″. A recording of a live performance with Hermann Scherchen conducting the Philadelphia Orchestra from 1964 lasts 15′15″. Leonard Bernstein conducted it during the funeral Mass for Robert F. Kennedy at St. Patrick's Cathedral, Manhattan, on 8 June 1968, and he also briefly discusses this section along with the opening bars of the second movement in his Charles Eliot Norton Lectures from 1973. Although the Adagietto had regularly been performed on its own, it came to popular (i.e. non-classical) prominence in the 1971 Luchino Visconti film Death in Venice. In that film, the lead character was modified from the novel's original conception of writer to that of composer, with elements in common with Mahler. Since then, the music has been used across many fields, from advertising and figure skating to television and further film uses, easily making it the most familiar piece of Mahler's musical output. Mahler wrote his fifth symphony during the summers of 1901 and 1902. In February 1901 Mahler had suffered a sudden major hemorrhage and his doctor later told him that he had come within an hour of bleeding to death. The composer spent quite a while recuperating. He moved into his own lakeside villa in the southern Austrian province of Carinthia in June 1901. Mahler was delighted with his newfound status as the owner of a grand villa. According to friends, he could hardly believe how far he had come from his humble beginnings. He was director of the Vienna Court Opera and the principal conductor of the Vienna Philharmonic. His own music was also starting to be successful. Later in 1901 he met Alma Schindler and by the time he returned to his summer villa in summer 1902, they were married and she was expecting their first child. Symphonies Nos. 5, 6 and 7, which all belong to this period, have much in common and are markedly different from the first four, which all have strong links to vocal music. The middle symphonies, by contrast, are pure orchestral works and are, by Mahler’s standards, taut and lean. Counterpoint also becomes a more important element in Mahler’s music from Symphony No. 5 onwards. The ability to write good counterpoint was highly cherished by Baroque composers and Johann Sebastian Bach is generally regarded as the greatest composer of contrapuntal music. Bach played an important part in Mahler's musical life at this time. He subscribed to the edition of Bach's collected works that was being published at the turn of the century, and later conducted and arranged works by Bach for performance. Mahler's renewed interest in counterpoint can best be heard in the second, third and fifth movements of this symphony. World premiere: October 18, 1904, Cologne – Gürzenich Orchestra Cologne conducted by the composer. United States premiere: March 24, 1905, Cincinnati – conducted by Frank Van der Stucken. Belgian premiere: March 5, 1906, Antwerp – 'Nouveaux Concerts' conducted by the composer. Of Adagietto only: August 31, 1909, London – conducted by Henry Wood during a Proms concert. Of complete work: October 21, 1945, London – London Philharmonic Orchestra conducted by Heinz Unger. After its premiere, Mahler is reported to have said, "Nobody understood it. I wish I could conduct the first performance fifty years after my death." Herbert von Karajan once said that when you hear the symphony, "you forget that time has passed. A great performance of the Fifth is a transforming experience. The fantastic finale almost forces you to hold your breath." ^ Willem Mengelberg's conducting score of Mahler Symphony No. 5. Handwritten quote of the poem on page 178, Adagietto. Nederlands Muziek Instituut. ^ Henahan, Donal (9 June 1968). "Protestant and Catholic Songs Mingle With Symphonic Music" (PDF). The New York Times. Retrieved 19 April 2014. This page was last edited on 29 March 2019, at 07:25 (UTC).